Dai133 (2 years ago) Inappropriate? Is there a high res version, would be cool for close-up renders. mastormind (8 years ago) Inappropriate? is there a way to lose the text?? Briarius (8 years ago) Inappropriate? Absolutely amazing work with the model. Great job! Thx. Hey thanks this is a really great looking model great job it will come in usefull real soon so thnkx again! Varderan (9 years ago) Inappropriate? How do you get rid of the text at the bottom? clarinutty99 (9 years ago) Inappropriate? [...it ate my comment. How rude. Sigh...] ...of course legally purchased) copy. 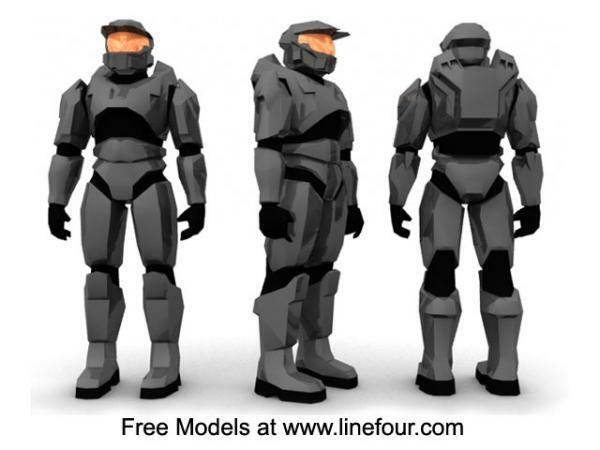 Poser/rigging: I don't play Halo, but I'm sure a modeler who spent this much time building did it faithfully to the original design. I don't expect the MC character was made for typical Poser scenes...he doesn't need to hold his arms out to hold a machine gun. Not a bad model at all, despite the ads hiding in him. ;) (Not a bad idea for any freebie, actually. Go for it!) Mr. ANGRY: Turn the default material invisible if you're unable to delete polygons. No big deal. For the Maya kids: Come now, Maya can import OBJs. Every 3D program worth its weight in electrons can and Maya is in the big league. Read the manual that came with your (of course more …Not a bad model at all, despite the ads hiding in him. ;) (Not a bad idea for any freebie, actually. Go for it!) Mr. ANGRY: Turn the default material invisible if you're unable to delete polygons. No big deal. blueteak (11 years ago) Inappropriate? please make some more, like a brute or elite, or something, great work. Linefour.com (11 years ago) Inappropriate? Not sure what you are on about Anonymous below. The model is free; I have not made you buy anything. The object is free on my website as is free on this site. It%u2019s downloadable for free, as are all models on this site. If you are not sure how to download something then read the instructions or call admin, slander doesn't work. Bob Jimmy (11 years ago) Inappropriate? Nice Model and great Presentation! I love the render! dogbite1066 (11 years ago) Inappropriate? Great job! Just what everyone was looking for. A good rendition of the 'chief. loublue (11 years ago) Inappropriate? Excellent Model.... Good number of formats too.